LONG LOOK, Tortola, VI – Man of the cloth, Curnal P. Fahie, running At-Large under the Hon Ronnie W. Skelton (AL) Progressive Virgin Islands Movement (PVIM-NDP 2) for the 2019 General Elections, is promising an improved business environment in the VI if elected to the House of Assembly (HoA). Mr Fahie, a local Apostle, reaffirmed his commitment to the business community at a PVIM rally at the Stickette in Long Look, yesterday, Friday, February 8, 2019. “I am here tonight to give you the people of the 7th district and the territory of the BVI my pledge as the people’s warrior to fight for my community and my entire BVI in the next House of Assembly,” he said. According to Mr Fahie, “They use to say that nothing good can come out of Long Look, but tonight I’m here to put death to those words and to reaffirm my commitment and that of my PVIM teammates to work together to continue to make the 7th district and the entire BVI great again,” he told those gathered at the rally. He said the district has a very rich heritage where some of the first businesses in the territory came from the Long Look/East End area, “We have a strong genetic history of entrepreneurship and we want to create even greater opportunities for the people of this seventh district,” he uttered. “It is good to have the skills, but it is even better when there is a government in place that creates opportunities for the people so their skills can be used at its fullest potential, a PVIM Government and a team will do just that,” he said emphatically. Mr Fahie further said that under a PVIM Government, they will work on strengthening local businesses, “through training in new cutting edge technology within this community,” as just one of the many plans to transform the country. “I am passionate about strengthening our already existing businesses, I pledge to work along with the people and the business owners in this community to ensure their sustainability of the present and emerging businesses and create the necessary resources needed to make them more viable,” he said. He continued, “I said all of the above to show, we the people of the 7th district have played and continue to play a vital role in the development of the BVI, therefore I ask you, is there not a cause?” he questioned the audience in pushing forward his points. 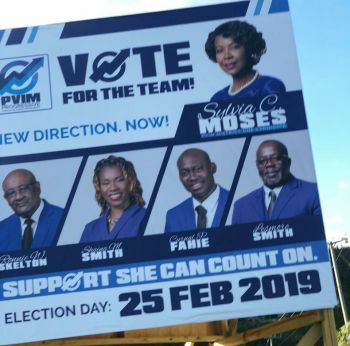 According to Mr Fahie, the people of the VI and especially the 7th district are worth more than the social ills facing them and he will fight to make sure that worth is realised under a PVIM Government. Couldn’t tell whether he was vying for the 7th or At Large. It’s a no for me. But wont he still be a joke? He was with the green but he believes God sent him in the blue. Bad bad choice. Terrible! There should be no mixing of politics and religion. Stop running as an apostle or stick to that job. whats the difference, politics and religion,all they been doing is dividing and taking from people for centuries,so he's in the right place. Self proclaimed apostle ?? No vote from pur family. There is so many people talking now a day's that you don't know what God is saying.